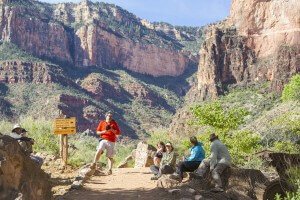 Guests take a break along Bright Angel Trail on the hike in. This is the perfect, double-bucket-list trip for hiking enthusiasts who love a challenge. 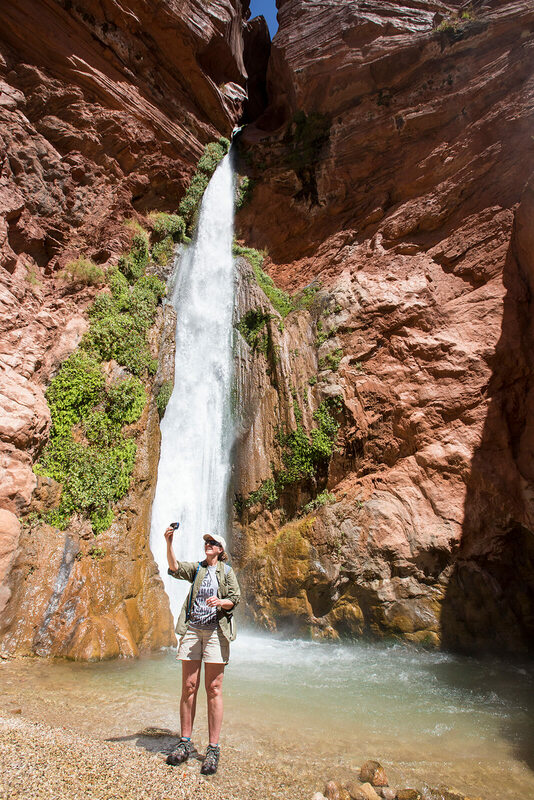 If you’ve always wanted to raft and hike Grand Canyon, this is the trip for you! 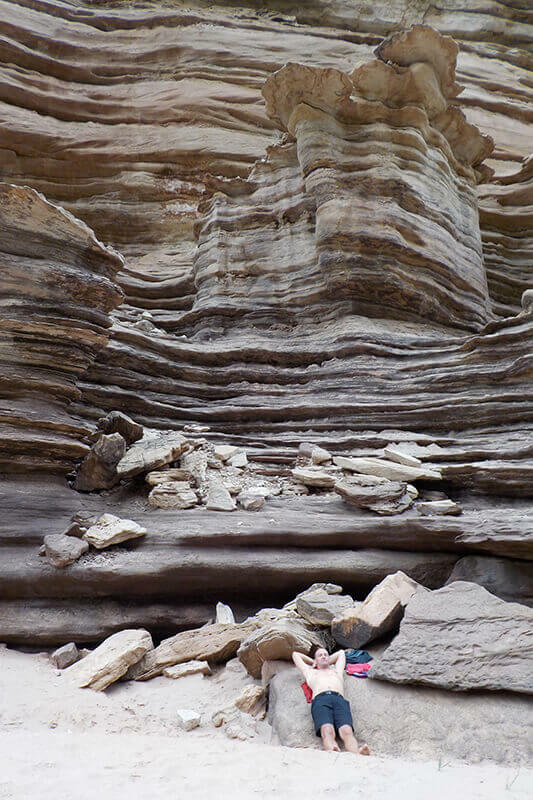 This whitewater vacation, only run once a year, includes two extra days that allow ample time to hike in the Canyon. The average high temperature along the river in April is 82 degrees, and the average low is 56. On this unique extended trip, you’ll experience amazing hiking weather and you’ll have the time to explore sites inaccessible throughout the rest of the season. 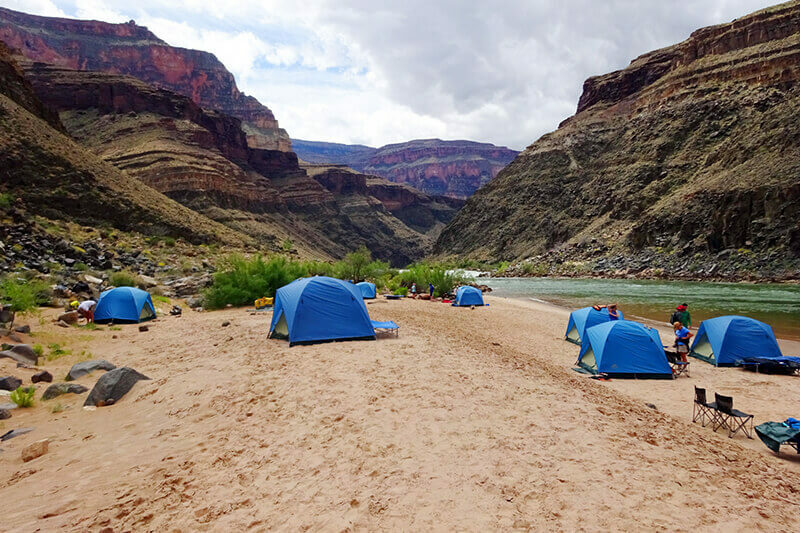 After a strenuous 8-mile hike into Grand Canyon from the South Rim, with all your personal gear loaded into your backpack, rafters will encounter lots of whitewater on this tour. Each day includes side hikes to places like Deer Creek Falls and rides through rapids like Hermit, Crystal and Lava Falls. 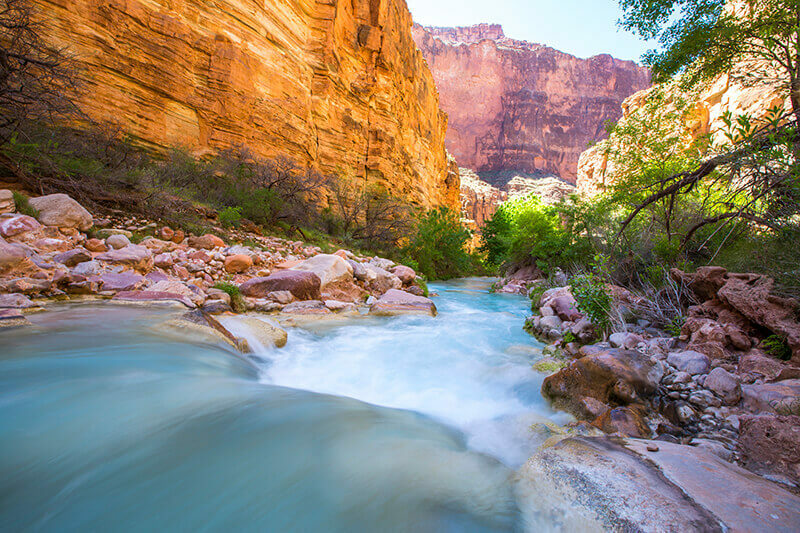 Pass Havasu Creek on the journey through the Inner Gorge of Grand Canyon. On the seventh day, your river trip will end at Diamond Creek with included ground transportation to nearby Peach Springs, AZ followed by ground transportation back to South Rim or Flagstaff, AZ. GCW’s motorized rafts are 35-feet long, seat 14 people per boat and have one guide driving from the stern. Since we always run two motor boats per trip, expect 28 passengers on your adventure. 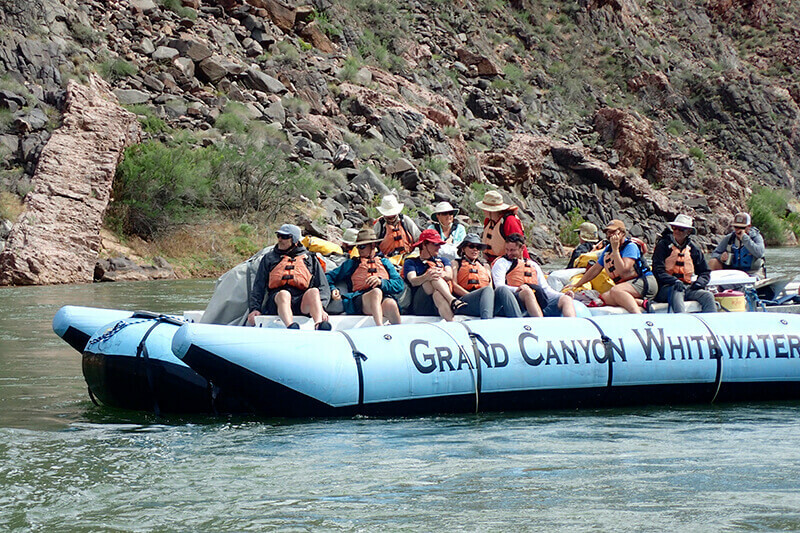 The type of motorized raft we run is called an S-Rig and guests say we have the most comfortable set-up in the Grand Canyon. 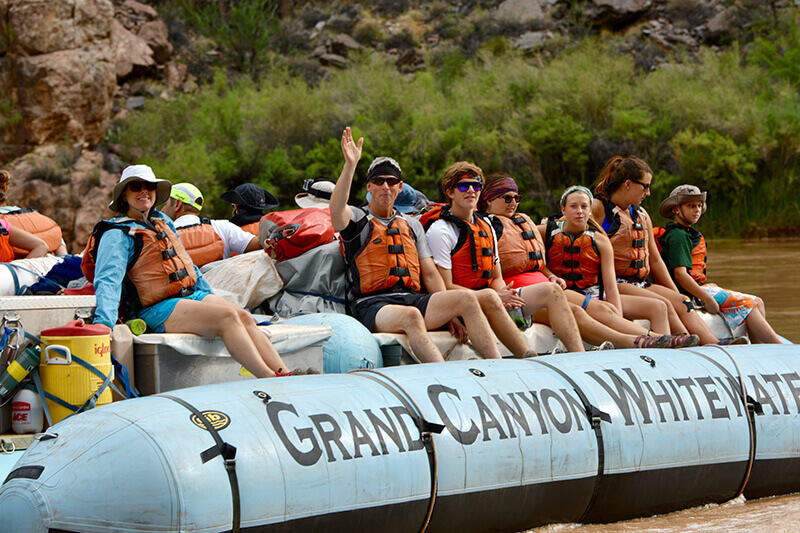 Grand Canyon Whitewater provides all the necessary equipment for rafting and camping including dry bags, tents, sleeping bags, cots and chairs, so you don’t need to worry about packing any of those things in with you. 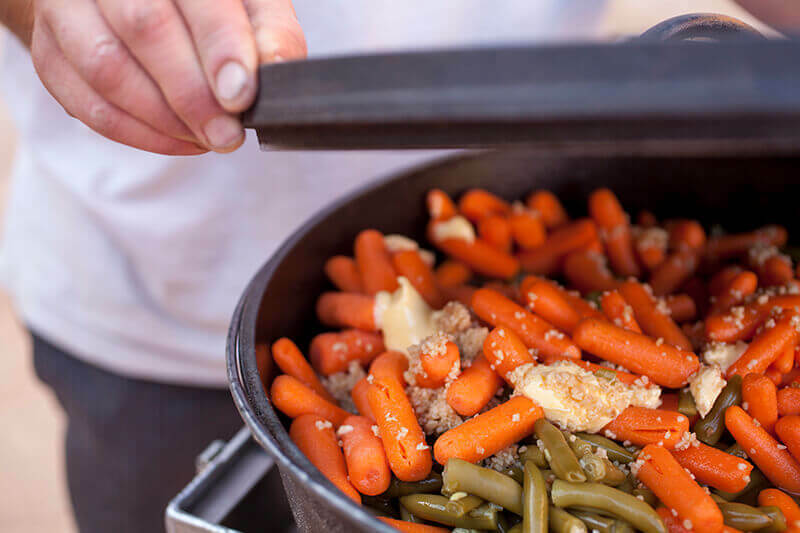 We provide all meals on the river, but you will need to bring your own hiking backpack, containers to carry water, and snacks for the hike into the Canyon. 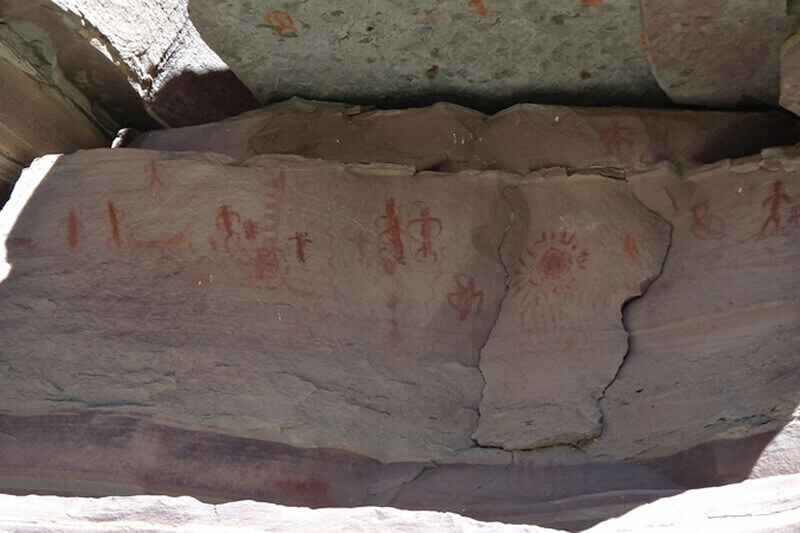 We also strongly recommend hiking poles for this trek, as well as the mule duffel service (888-297-2757) to carry duffel bags into the Canyon. There is an additional cost for the mule duffel service. Reservations must be made in advance and duffel bags must be dropped off at South Rim the day before your trip launches. We encourage everyone to watch this video on the required hike. 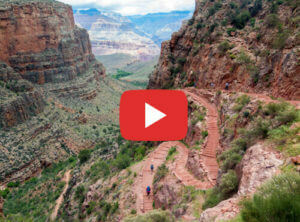 The hike, via Bright Angel Trail, typically takes a prepared hiker 4-6 hours (or more). You’ll descend about 4,400 ft. (1,340 m) on your downhill hike through millions of years of geological history. The trail is well maintained but it is all downhill and much of it is in full sun. 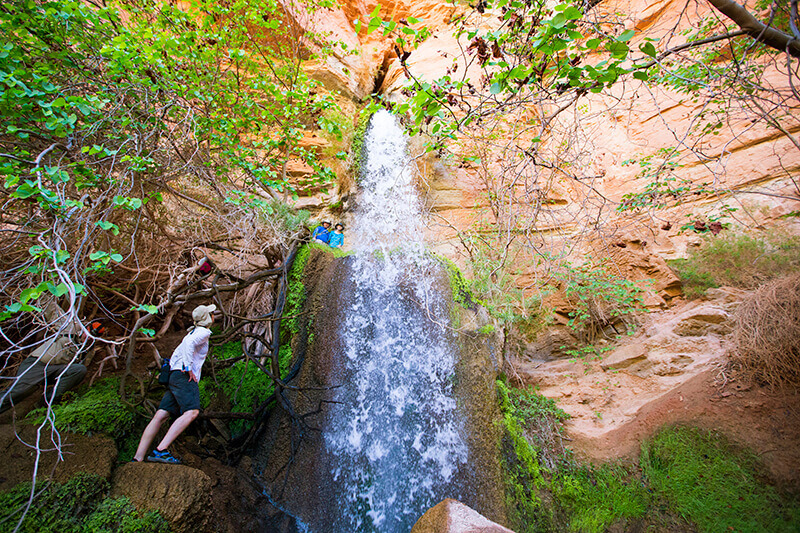 There are three water-refill stations and four resthouses along Bright Angel Trail, which is one of the most frequently used trails in Grand Canyon. There are many log steps built into the trail, to help prevent erosion, and many switchbacks. Because of the difficulty of the mandatory hike into the Canyon, you must call us to book — online reservations are not allowed. We’ll want to talk to you, and everyone in your group, about your hiking experience, your current fitness level and routine, how to train and prepare for this hike, and any medical conditions that might affect your ability to get the most out of this experience. We do not recommend this trip for people with a history of heart problems, high susceptibility to heat-related illness or exercise-induced asthma. Other factors, including being out of shape, overweight, or a smoker, also may negatively impact your hike. There are two ways to get to the trip’s launch point and home again at the end of your adventure, depending on whether or not you will have a vehicle. With both options, you will need to spend the night before your trip launches at the South Rim of Grand Canyon, as the hike into the Canyon begins early the morning of your trip. If you DO have a vehicle, you will drive yourself to the South Rim the day before your trip launches. You can leave your vehicle at the South Rim and our optional transportation will shuttle you back to the South Rim at the end of the trip. If you DO NOT have a vehicle, you can arrive at South Rim by several different options. You can fly between South Rim and Las Vegas with Grand Canyon Airlines. To book flights to and from South Rim visit www.bar10.com or call 800-582-4139. You can also use Arizona Shuttle for rides between Phoenix, Flagstaff and the South Rim. To book the shuttle visit www.arizonashuttle.com or call 800-888-2749. At the end of the trip, our optional transportation will return you to either the South Rim or Flagstaff. Our optional return transportation for this trip costs $75 and is included in the prices listed above. We think our post-trip transportation is the best option for the majority of our guests, but we are happy to discuss other options with you. If you choose not to use our provided transportation, you must call our office to remove our transportation and to discuss alternatives. You will want to stay at the South Rim Village in Grand Canyon National Park the night before your hike in. As rooms book up quickly at the South Rim, please book your room as soon as possible. Reservations open 13 months in advance. To book lodging, visit Xanterra at www.grandcanyonlodges.com. We recommend spending the night your river trip ends in Flagstaff or at the South Rim. 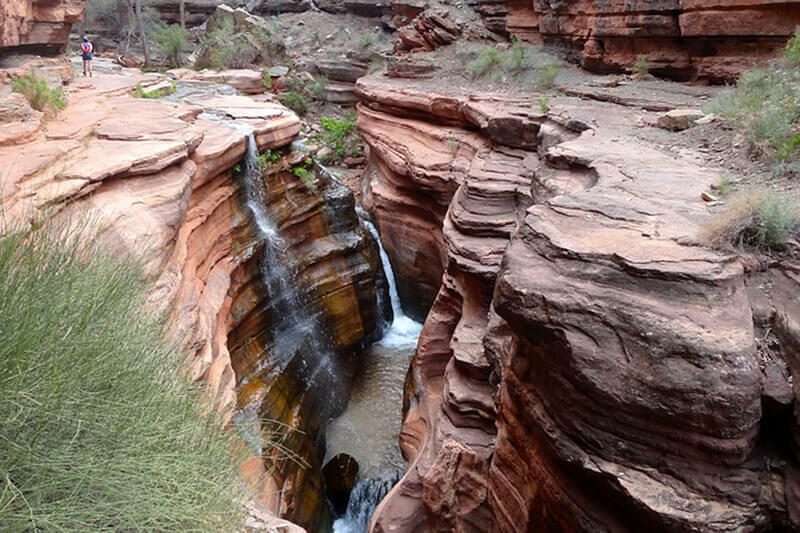 Deer Creek Falls is a beautiful side hike in the Grand Canyon. Passengers must be 8 years or older to participate in this trip.